I have loved the Monkeewrench series so far, it seemed like it was going to be a fresh take on murder investigations but actually I think it's run it's course now. 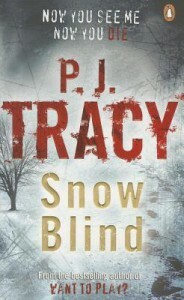 I enjoyed Snow Blind as a murder mystery/thriller and found it 'unputdownable' but the Monkeewrench team aspect of it was not really a huge part and seemed pretty much unnecessary. It's a shame at how this has gone because it showed such promise at the start of the series; I really do hope that this writing team can either get it back to how it was or else put it to bed and continue to write without the Monkeewrench team.